I'd like to tell you that I spent the past week elbow-deep in dough, slaving away at the oven for your sakes, but in reality I spent most nights after work watching The Best of Youth. It started out slow, but my God, by the end I was a hot mess of heaving sobs and heartache. You know when you want to jump right into the television set and hug someone that that thing you're watching is good, good cinema indeed. 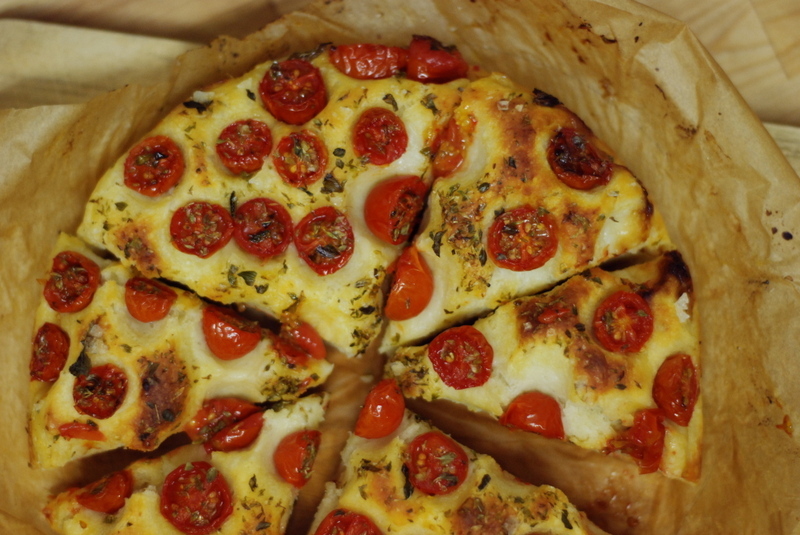 So it's actually kind of ironic that this week turned out also to be the week I finally figured out that darn focaccia I kept going on about after I got back from Europe. Yes! It took me four tries and close to a month, but I finally got it. Victory has never tasted so sweet. Or, actually, salty and pliant and herby and mmmm. Turns out that most of my problems with the three previous focaccie I made had to do with the amount of fresh yeast I was using. A little research into other people's potato breads and some choice advice from the Internet (thank you!) got me on the right path. I rejiggered the yeast and the temperature of the oven and suddenly everything starting falling into place. Oh, and I found Italian oregano. Well, really, Sicilian oregano (those are two different things, wink wink). At a grocery store in the Hudson River Valley. Weird, right? Only that I've also seen that exact package at Dean & Deluca in the city, so keep your eyes peeled, city folks. Herb nirvana is at your fingertips. The oregano, instead of being stripped from its stalks and packaged in little pots and sachets, is gathered and packaged into large plastic sacks, so you can strip the leaves and buds yourself and your oregano isn't turned to dust by someone else's fingers. This oregano is incredibly fragrant and worth seeking out. Hop to it! This might be one of the easiest yeast doughs you'll ever make. And it's so quick that you can start the dough after getting home from work and eat focaccia for dinner that same night. Bliss, I tell you. Make a big salad or a pot of braised vegetables to round out your meal and you'll have contented eaters all around. I suppose you could also make this for a dinner party and cut it into wedges to serve as an aperitif, but it feels so nicely rustic and humble that I kind of prefer it just hacked into pieces at the cozy dinner table. There's an agreeable chewiness to the damp crumb from the potato, which also gives the focaccia a delicious sweetness and heft. Sweet, juicy tomatoes explode gently here and there, and unexpected crystals of salt provide a welcome flavor and textural balance. Oh, it's just so good. I hope you think so too. 5. 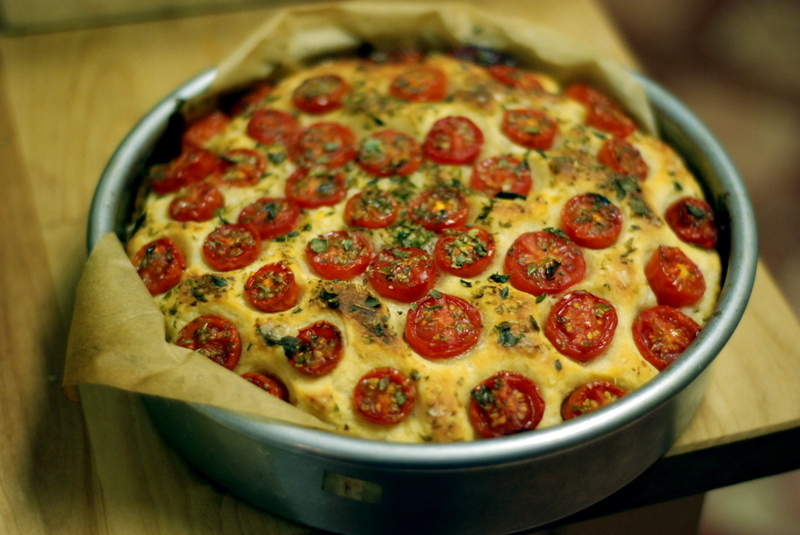 While the focaccia is resting, preheat the oven to 425 degrees. Place the cake pan in the oven and bake for 40 minutes, rotating the pan halfway through. 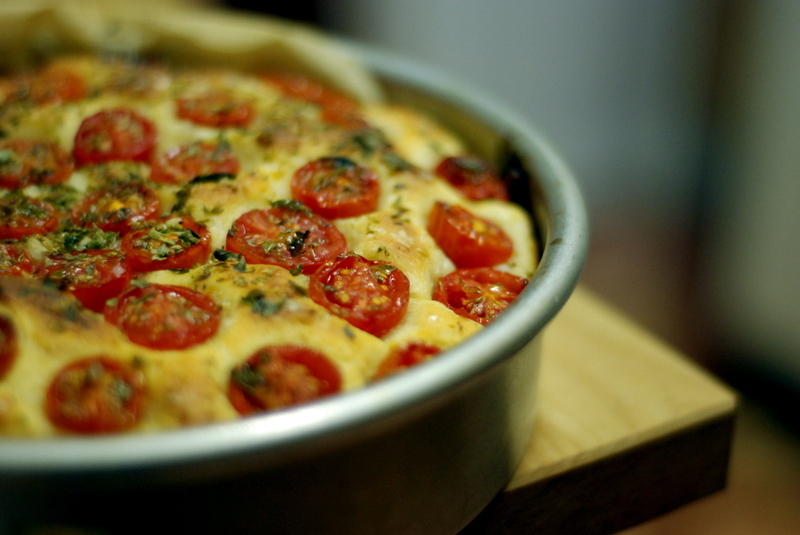 Let cool on a rack for 20 minutes before removing the focaccia from the pan.